The stern of the Dmitry Donskoi. File photo of the Dmitry Donskoi. 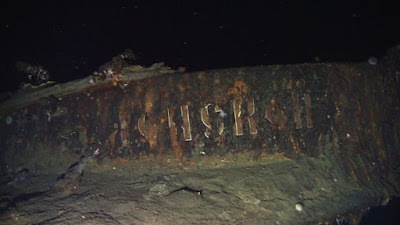 Explorers have found the wreck of a Russian Imperial Navy ship that was sunk 113 years ago and may contain $130 billion in gold bars and coins, according to news reports. In a statement, salvage company Shinil Group confirmed that the stern of the vessel, the Dmitry Donskoi, had been discovered off South Korea’s Ulleungdo Island. It was badly damaged following an attack by Japanese warships during the Russo-Japanese War and was scuttled in the Sea of Japan on May 29, 1905. The Korea Times reports that the South Korean salvage firm, which has been searching for the wreck for years, used two manned submarines to spot the ship on Saturday. 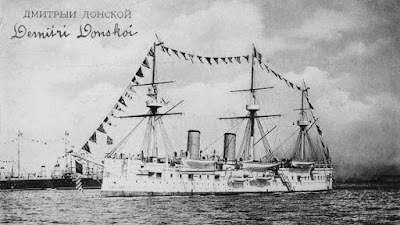 The Dmitry Donskoi, a 5,800-ton ironclad cruiser, was in a fleet of 38 Russian Imperial Navy ships deployed from the Baltic to the Pacific. Citing historical accounts, The Express reports that the Dmitry Donskoi may be treasure-laden. In addition to carrying port expenses and salaries for the fleet’s sailors and officers, she may have held gold reserves of other Russian ships damaged in the Battle of Tsushima in May 1905. Rumors of a gold hoard on the ship have swirled for decades, although the possibility of a sunken treasure has also been viewed with skepticism. According to The New York Times, one historian told Bloomberg in 2000 that it would have been safer to send the gold to the Russian Pacific port of Vladivostok by rail, as opposed to using a ship. In its statement, Shinil Group said that it had found a large amount of iron boxes in the ship’s stern, and “will take measures to preserve them.” The boxes’ contents have not been revealed. In addition to the stern, 203 mm cannons, 152 mm long-distance guns, a number of machine guns, anchors, two stacks, three masts, wooden decks and armor are also visible on the wreck. All three of the ship’s masts and its two chimneys are broken. Experts from the U.K. and Canadian marine exploration company Nuytco are also part of the international team working on the Dmitry Donskoi project.